OCM Recycle will come to your facility and pick-up your unwanted/unused electronics. All items will be dispositioned and disposed of according to your requirements. We do the heavy lifting! 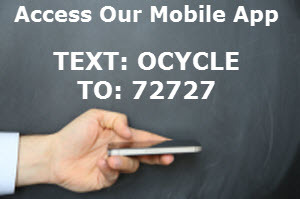 OCM Recycle prefers to refurbish and re-sell as many of the electronics devices as possible. Ultimately, this keeps items out of landfills and in use. OCM Recycle will upgrade and repair desktops and laptops and other electronics, recycling them back into businesses, institutions, and into the local community. OCM Recycle will administer a data destruction plan tailored to your specific needs with a letter of destruction upon request. Proprietary information and components will be removed per your specifications. OCM Recycle reuses and recycles components whenever possible. OCM Recycle will harvest components out of electronic devices which are not re-salable as is, and use these components to upgrade other devices for re-sale. Should your electronic equipment be non-functional and therefore not a candidate for re-sale, OCM Recycle will guarantee the disposal of the device in an eco-friendly manner. Metals and plastics are recovered and hazardous materials are disposed of properly. Call us today for a free consultation regarding your unwanted/unusued electronics.